Although we lost the incredibly talented designer this past year, Estée Lauder and Lily Pulitzer collaborated for the second year to bring you this exclusive cosmetic bag as their Limited Edition Spring 2014 gift with purchase. Beginning February 3, 2014 this bag could be yours! 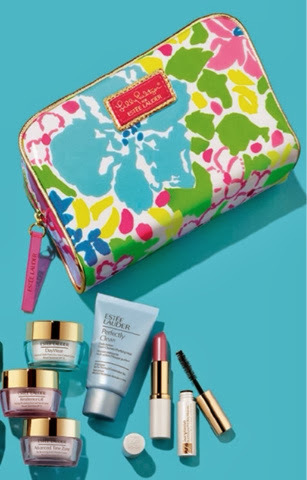 Each retailer-exclusive Lilly Pulitzer print cosmetic bag comes with a selection of Estée Lauder deluxe samples with any purchase of $45 or more available EXCLUSIVELY at www.EsteeLauder.com. This Limited Edition Spring 2014 cosmetic bag will include deluxe samples of the following: Pure Color Lipstick, Sumptuous Bold Volume Lifting Mascara, Advanced Night Repair Synchronized Recovery Complex, a choice of Advanced Time Zone Age-Reversing Line/Wrinkle Creme, Advanced Night Repair Eye Synchronized Recovery Complex or Resilience Lift Firming/Sculpting Eye Cream and lastly, your choice of Advanced Time Zone Age-Reversing Line/Wrinkle Creme SPF 15, DayWear Advanced Multi-Protection Anti-Oxidant Creme SPF 15 or Resilience Lift Firming/Sculpting Face and Neck Creme SPF 15. The bag's print was inspired by the Palm Beach lifestyle- a beach bronze, toes in the sand and a fruity drink in- hand. Living through this NYC Polar Vortex, I can honestly say I am looking forward to SPRING! Bring it on...and get me that bag! Love the print and what's inside!